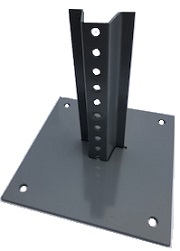 Economy U-Channel Post Surface Mount Base with 10-inch square (1/4-inch thick) steel plate and four 1/2-inch mounting holes welded to 10-inch tall 2 lb/ft u-channel post stub with 7/16-inch holes at every inch. Used to permanently and securely install 8-, 10- or 12-foot u-channel post to concrete. Requires four concrete anchor bolts (sold separately). Color: Battleship Gray.